The draft of Plaça Reial by Francesc Molina was implemented from 1848 to 1859. The complex of classical buildings was built instead of a Capuchin monastery. In the middle of the Plaça Reial is the cast iron Three Graces Fountain. The street lights, which light the place in the evening and at night, are an early work of the architect Antoní Gaudí, who was still unknown at that time. You can reach the place through three covered entrances. The biggest entrance, the Carrer de Colombia, is located on the Rambla. The Rambla dels Caputxins is located about 40 metres away. 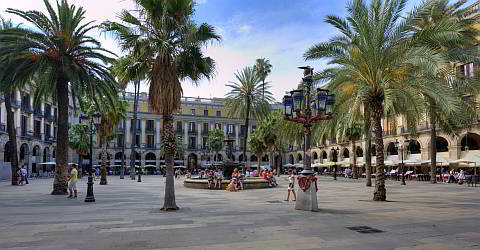 The Plaça Reial is planted with palm trees, which give the square a very special Mediterranean flair. That type of square - a big square, surrounded by 3 to 4-storey houses is quite typically Spanish. The Plaça Reial was rehabilitated in the early 80s. Cafes, restaurants and discos line the square. Visit the Plaça Reial at different times of the day, the atmosphere is always different. There you can eat well, have a drink or simply start a pub crawl in the Gothic Quarter.